Select the diameter of the rod you require to display the cost per 2m length. 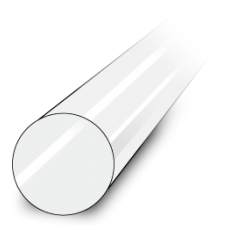 Clear Perspex Acrylic rods are sold in 2 metre lengths and a wide range of diameters. Acrylic / Perspex Rod can be used for a wide range of applications from Light Shafts an light spears for LED and Electronic equipment to a wide range of Point of Sale and Acrylic Displays, as well as Art, Sculpture, Signage, and much more. Acrylic / Perspex Rod can be turned, milled, drilled, sanded, polished and heat formed into just about any shape desired with the use of appropriate equipment. Rods from 25mm to 100mm diameter can be purchased online. Rods from 3mm to 20mm can be purchased from our head office. Please call us for freight charges for these smaller sizes. Prices are shown in Australian Dollars (AUD) excluding shipping costs. These will be calculated for you at the Checkout.